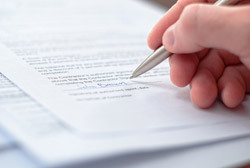 Upon your accepting an employment position, or during employment or at time of your leaving your job, your employer may ask you to sign a non-compete agreement which may be part of a severance agreement. The non-compete agreement may contain terms that prevent you from working for the employer's competitors for a certain time period within a certain geographic area. You also may be sued by a an employer who alleges that you violated the non-compete agreement. Sometimes these agreements may be unenforceable if they are too restrictive, and you may find you are unable to find work in your field and still adhere to the terms of the non-compete agreement. Hope A. Lang can give you legal counsel as to these issues. Hope A. Lang, Attorney at Law can counsel you and represent you in contract negotiations and other transactional issues.